Mary is surprised when an angel announces that she will become pregnant and give birth to the Son of God. She tells her betrothed, Joseph, and in time he accepts this. Together, they travel to Bethlehem for a required census, while a hunter is sent by the king to “end” them. Meanwhile, a mill donkey has escaped from his mill; he hopes to join the royal procession, but instead ends up travelling with Mary and Joseph. The familiar Nativity story is told largely from the point of view of Bo the Donkey. Mary names Bo; that helps him feel more connected to her. An older donkey that Bo works with decides to help Bo escape and chase his dreams. Bo shows loyalty to Mary and Joseph. This is a friendly way to re-tell this story to your kids. Two villainous dogs have a change of heart and decide that they need to try to be good. One of Bo’s friends is a very loyal dove. Want to help us do what we do AND get our reviews early? Please support us on Patreon! A wicked king is willing to kill all of the newborns in the land to ensure that a newborn king does not dethrone him. His willingness is mentioned, but nothing is shown or confirmed. A menacing villain is sent by the king to kill Mary. He ultimately falls, apparently to his death. 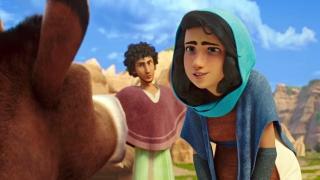 When Joseph misunderstands Bo’s efforts to save him and Mary, he initially tries to send Bo away. Bo does leave in anger, but then goes back, realizing that he belongs with Joseph and Mary. The brief scene of rejection could be hard for some viewers. Near the end of the movie, Bo’s former owner finds him and recaptures him. Bo is ultimately reunited with Mary and Joseph, but the surprising return of the miller – and Bo’s recapture – could be frightening to children who fear being returned to abusive situations. Two scary dogs, who are in pursuit of Mary, could frighten young children. 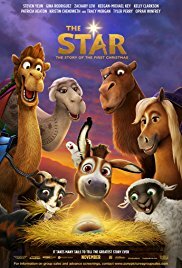 The Star is a fun retelling of the Nativity story. There are a few frightening scenes – the ongoing pursuit of Mary and Joseph by a large hunter and two dogs could scare young children, and Bo’s recapture could frighten children who fear being returned to abusive situations. Joseph’s temporary rejection of Bo could also be a trigger for some kids. Because of the potential for triggers for some kids who’ve been in hard places, I’d recommend this one for kids ages 9-14, although many younger kids will not be bothered by the potential triggers. 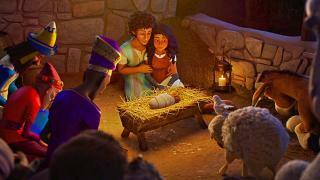 How did Bo help Mary and Joseph? How did the dove help Bo? Which friends help you a lot? If animals could really talk, what do you think they would say? Had you ever heard this story before?